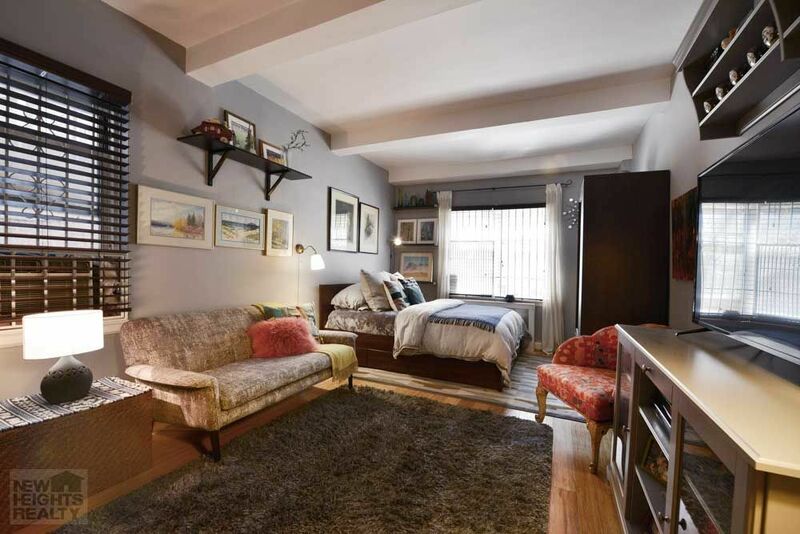 Cozy, Stylish Studio with Low Maintenance and Pied-A-Terre Welcome! Welcome home to this rarely available charming studio with low maintenance on one of Inwood’s most coveted streets. Upon entering it is clear that this well laid out studio, with excellent storage space, has been lovingly cared for and maintained. With its high ceilings and layout with distinct and separate areas such as an entry foyer, galley kitchen, main living area and dressing room, the 450 square foot studio makes for a spacious, efficient and inviting place to come home to. Thoughtful updates include a functional windowed kitchen with all new appliances, warm toned butcher block countertops, track lighting, Elfa shelving and subway tile backsplash. New baseboard molding surrounds the perimeter of the apartment and custom shelving in the foyer provides additional storage possibilities. The dressing room has been reconfigured to allow for plenty of hanging space and storage while the tiled bathroom - off the dressing room - offers clever floating glass shelves, a new granite topped vanity, and a built-in cabinet. Cozy and comfortable, the main living area allows generous room for a queen size bed, couch, entertainment center, desk and even additional clothing storage. The entry way with a large coat closet and pantry, currently doubles as a dining space. Facing south the apartment gets great light, and being a corner unit toward the rear of the building, it is far removed from any street noise. Constructed in 1951, 100 Park Terrace West is a pet-friendly 69 unit coop less than a block away from Inwood’s recently designated historic district. 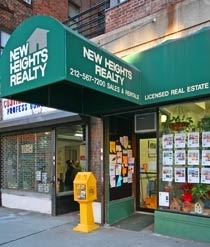 One of Upper Manhattan’s best coops, the property is run by an experienced managing agent and boasts strong financials. Furthermore the building’s incredible condition is owed to its resident superintendent of 20 years. Amenities include laundry room, package room, video intercom system, bike storage with wait list, and garage with wait list. Situated on the corner of 218th Street and Park Terrace West, the cooperative is in close proximity to Isham and Inwood Hill Parks replete with hundreds of acres of woodland, playgrounds, tennis courts, and bike trails. The famed Columbia Athletic Center is directly across the street and just a short walk leads you to the Harlem River waterfront. Great restaurants and a Saturday farmer’s market only add to the neighborhood’s desirability. Convenient to major highways, The Metro-North, the 1 and A subway lines, 100 Park Terrace West is within 40 minutes to midtown. Come see your new studio and what life is like in Inwood! Building is looking for 25% DTI for the buyer.